A view over Bonne Bay, in the middle of beautiful Gros Morne National Park. Gros Morne National Park is considered one of the gems of Newfoundland, and rightly so. A UNESCO World Heritage Site, the park is known around the globe for its amazing geology, stunning scenery and world class hiking. It is also an excellent place for birding and general nature viewing. Located on the island’s west coast, it is the second largest national park in Atlantic Canada (the largest also being our own Torngat Mountains National Park). 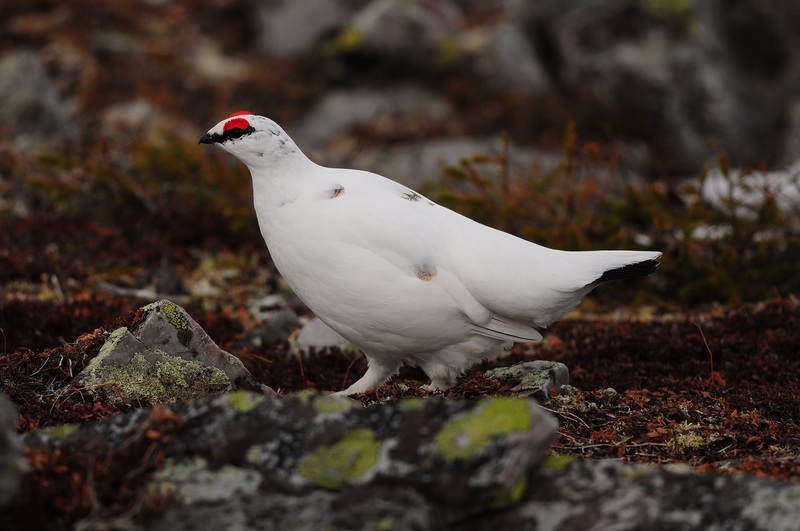 Rock Ptarmigan are an iconic bird of Gros Morne National Park. They are year-round residents of the Long Range Mountains which stretch along the coast and throughout the park. A great variety of birds can be found in and around the park, owing to its diverse and well protected habitats. The lush boreal forests are home to sought-after species like Boreal Chickadee, Gray Jay, Black-backed Woodpecker and Northern Saw-whet Owl. The beautiful songs of warblers, vireos and thrushes echo through the landscape on cool summer mornings. The Arctic-alpine habitat atop the Long Range Mountains provide breeding grounds for Rock Ptarmigan, White-crowned Sparrow and American Tree Sparrow. Non-avian residents of these high elevations Arctic Hare, and even Woodland Caribou (which can also be seen near the low-lying coast during much of the year). 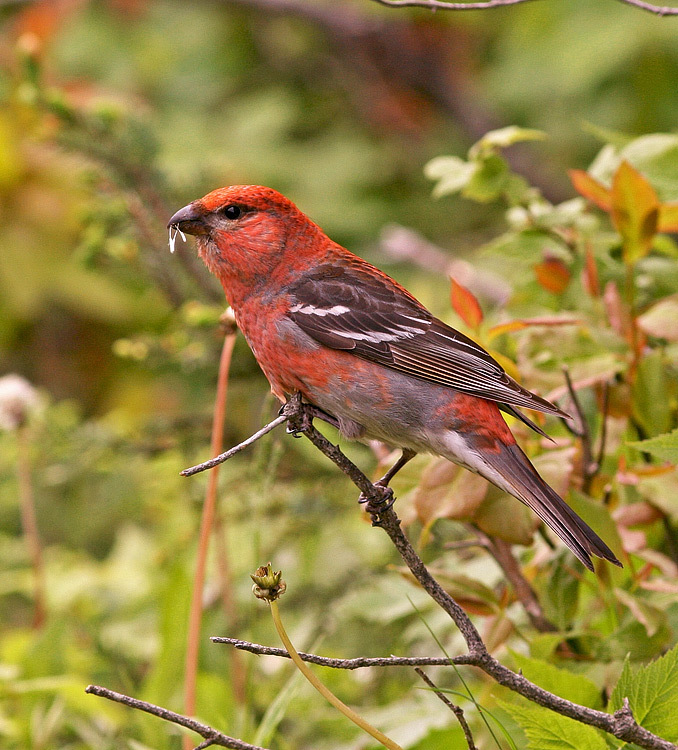 Pine Grosbeaks are abundant throughout much of the park … this one was feasting on seeds right alongside a popular hiking trail in late June. The exposed coastline is an excellent place to see seabirds such as Northern Gannet, Common Eider and Common Loon during the right time of year, while sheltered bay and harbours are often home to Mergansers, Goldeneye and watchful Bald Eagles. Many species of shorebirds also congregate during fall migration in places, especially on the vast tidal flats of St. Paul’s Inlet, and the threatened Piping Plover has been found breeding in one or two protected locations the past few years. Checklist to the Bird of Gros Morne National Park – an unofficial list of the birds that have been recorded in the park, and their relative abundance (Thanks to Darroch Whitaker for putting this together!). In addition to endless natural wonders, the park and its surrounding communities also offer a wide range of other tourism and cultural experiences … from world-class theatre to writing/storytelling festivals and pubs to fancy restaurants. Whether you prefer camping in one of the park’s beautiful campgrounds, backpacking your way through the country, or relaxing in a cottage, bed & breakfast or hotel – this place has it all. 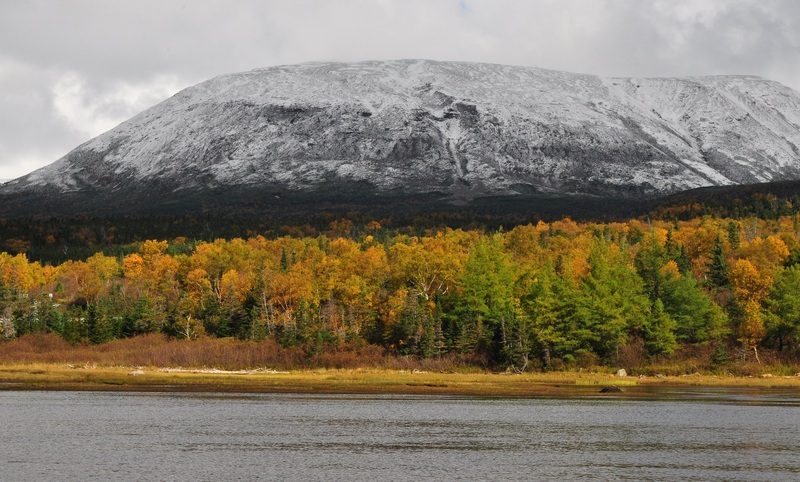 The park is named after Gros Morne Mountain – the island’s second highest peak, part of the Long Range Mountain chain, and a popular hiking destination. 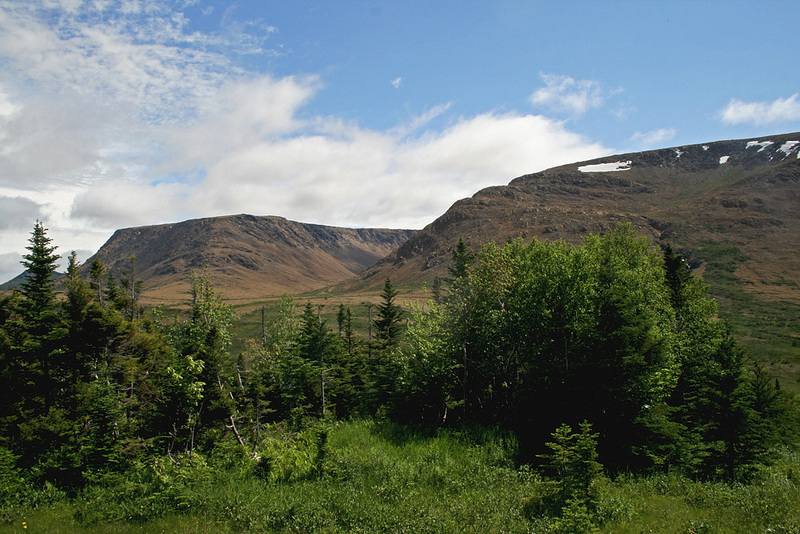 The amazing scenery and geology of Gros Morne National Park, like the Tablelands pictured here, is known throughout the world. Much of the early evidence proving the theory of plate tectonics and continental drift came from here! 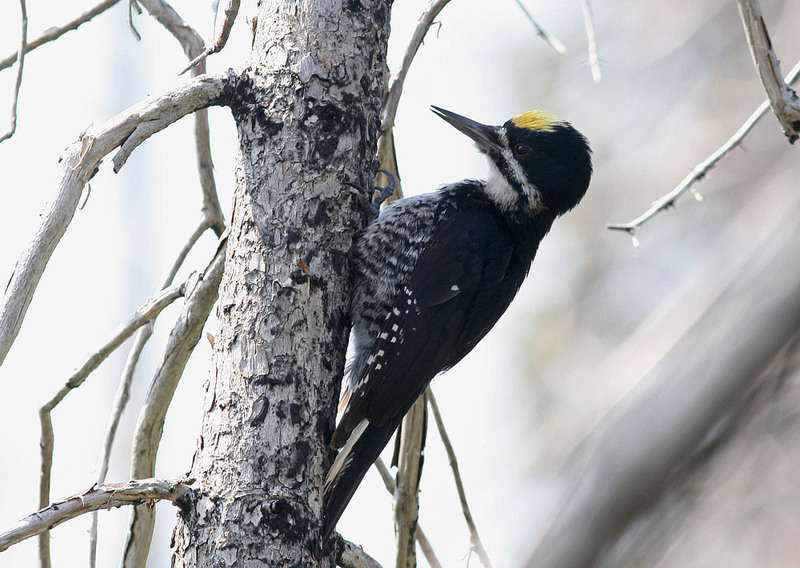 Black-backed Woodpecker is another sought-after species that breeds throughout the boreal forests of the park. 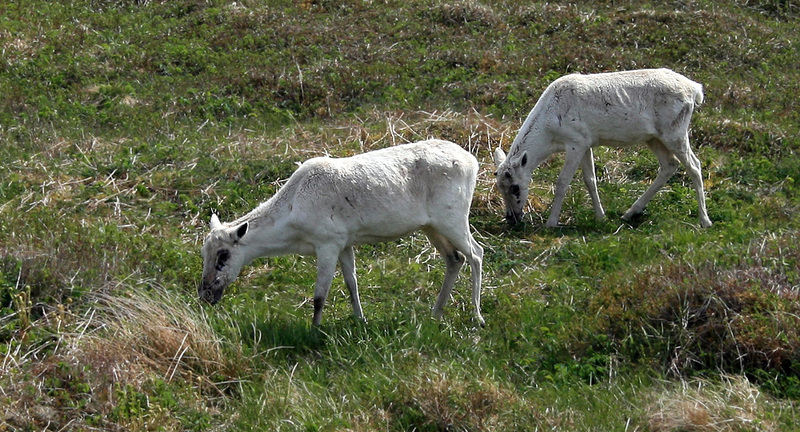 Woodland Caribou are a real treat to see. They can be found in the park’s high elevations during the breeding season, and pretty much anywhere during the remainder of the year. Gros Morne National Park offers some of the best birding and nature viewing in the province, in a stellar setting with world-class amenities. Don’t miss out on your next visit! bird⋅the⋅rock is able to include this amazing location in multi-day tour itineraries, or help you make the most of your own visit through our “D⋅I⋅Y Tour” service. Contact us for more details. Hello. Thank you for your wonderful description of birding in Gros Morne Park! My husband and I will be visiting Gros Morne Park this summer. Do you offer any guided bird walks in Gros Morne Park on July 5th or July 6th? If not, could you recommend anyone? Thank you for your kindness and assistance.